Kamden Strunk Teaching - Kamden Strunk, Ph.D. Basic Methods in Educational Research: Major modes of inquiry in contemporary educational research including experimental, casual comparative, descriptive, qualitative inquiry, and action research models. Fall 2015 (2 sections, 30 students total); Fall 2016 (10 students); Spring 2017 (8 students). Design and Analysis in Education I: Basic methods of inferential analysis including t-tests, between and within subjects ANOVA, mixed ANOVAs, and hierarchical designs as they are utilized in educational research. 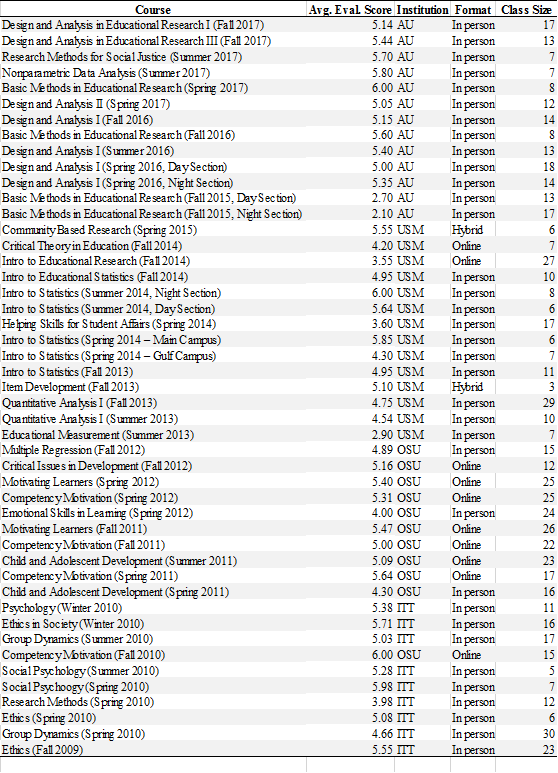 Spring 2016 (2 sections, 40 students total), Summer 2016 (14 students), Fall 2016 (9 students), Fall 2017 (17 students); Spring 2018 (1 online and 1 face-to-face section scheduled). Design and Analysis in Education II: Bivariate and multiple correlation and regression analysis, trend analysis, analysis of covariance, and logistic regression, as they are utilized in educational research. Spring 2017 (13 students). Design and Analysis in Education III: Discriminate analysis, MANOVA, canonical correlation, path analysis, exploratory and confirmatory factor analysis, and hierarchical linear modeling as they are utilized in educational research. Fall 2017 (13 students). Nonparametric Data Analysis in Education Research: Common nonparametric statistical tests appropriate for use with nominal and ordinal data in educational applications. These include rank-order correlation, sign tests, median tests, analysis of variance of ranks, and log-linear analysis. Summer 2017 (7 students). Research Methods for Social Justice: Introduces theoretical and methodological approaches to scholar-activism, research for social justice, and research for educational equity. Summer 2017 (8 students). Critical Theories in Education: Exploration of perspectives and practices in critical education. Includes theoretical issues, practical applications, and current issues. Fall 2014 (7 students). Educational Research – Interpretation and Applications: An orientation to the information, skills, and competencies necessary to understanding research in education, along with a rudimentary introduction to conducting research. Fall 2014 (27 students). Helping and Counseling Skills in Student Affairs Practice: Emphasizes theories and principles undergirding the practical application of various helping techniques. Spring 2014 (17 students). Introduction to Educational Statistics: Basic concepts and computations in descriptive statistics. Introduction to sampling procedures and inferential processes in educational research. Fall 2013 (11 students), Spring 2014 (2 sections, 13 students total); Summer 2014 (2 sections, 14 students total); Fall 2014 (11 students). Item Development: Theories and concepts in item development. An overview of the process and procedure for item development with an item development project. Fall 2013 (3 students). Measurement in Educational Research: Survey of the theory of measurement including true score theory, reliability, validity, item analysis, and item-selection techniques. Summer 2013 (8 students). Quantitative Analysis I: Probability theory and theoretical distributions in experimental and quasi-experimental design. Techniques include t-tests, simple and complex analysis of variance, analysis of covariance. Summer 2013 (10 students), Fall 2013 (29 students). Child and Adolescent Development: The person from conception through adolescence with focus on education implications of development in cognitive, affective, social, and physical domains. Spring 2011 (16 students), Summer 2011 (online, 23 students). Competency Motivation (online): Development of competence through the application of research based strategies in achievement motivation. Examines intellectual ability, motives, goals, attributions, competence perceptions and values as they relate to developmental issues, demographics, contextual influences, culture, and self-regulation. Fall 2010 (15 students), Spring 2011 (17 students), Fall 2011 (22 students), Spring 2012 (25 students). Emotional Skills in Learning: Striving for academic excellence through self-awareness and growth in areas of social and emotional development. Interpersonal and intrapersonal skills, leadership skills, and self-management skills in the context of emotional intelligence theories. Spring 2012 (24 students). Issues in Adolescent Development (online): Current issues in adolescent development in an educational context and culture, including self, family, peers, school and work relationships. Gender differences within culture, race and class examined. Current dilemmas explored using critical theory and action research. Fall 2012 (12 students). Motivating Learners (online): Current practices in learner motivation, school age through adult. Developing positive attitudes and building community in classrooms to stimulate motivation of all learners. Fall 2011 (26 students), Spring 2012 (25 students). Multiple Regression Analysis in Behavioral Studies: Applications of multiple regression as a general data analysis strategy for experimental and non-experimental research in behavioral sciences. Fall 2012 (15 students). Statistical Methods in Education: Statistical methods needed by conductors and consumers of research in education and the behavioral sciences. Introduction to interpretation and application of descriptive and inferential statistics. Spring 2013 (2 sections, 29 students total). Ethics: This course provides students the opportunity to explore competing ethical theories, and through analysis and critical thinking to determine their own code of ethics. Fall 2009 (23 students), Spring 2010 (6 students), Fall 2010 (12 students). Ethics in Society: This course provides a practical framework and a personal method for ethical thinking and ethical decision-making on issues in contemporary society. Students will analyze some of the major ethical dilemmas of the modern world. Winter 2010 (16 students). Group Dynamics: In this course, students examine elements of successful teams and small decision-making groups. Emphasis is on communication, critical thinking and group process techniques. Spring 2010 (30 students), Summer 2010 (17 students). Psychology: This course introduces psychological theories from behavioristic, humanistic, and biological viewpoints. Primary focus is on exploring how selected principles of psychology apply to students’ personal lives and social behavior. Students apply the skills of critical thinking, observation, and information gathering and analysis as they practice social science and scientific methodology. Winter 2010 (11 students). Research Methods: This course offers a step-by-step, systematic approach to conducting research. Emphasis is on using critical thinking, efficient research techniques, and the ITT Tech Virtual Library to produce an in-depth white paper. Spring 2010 (12 students). Social Psychology: This course introduces theories and principles of how an individual’s thoughts, feelings, and actions are influenced by their social interaction. This course focuses on how to apply these principles to understanding our dynamic world. Fall 2009 (12 students), Spring 2010 (5 students), Summer 2010 (7 students), Fall 2011 (10 students). Sociology: This course introduces the theories and methods sociologists use to explain and predict the dynamics of the contemporary social world. Through this study, the students will employ a “sociological imagination” as they make observations, gain insights, and make predictions that can influence their choices about their own social interaction. Fall 2011 (7 students). NOTE. All course evaluation scores have been converted to a six-point Likert-type rating, the rating system used by Auburn University. Scores that were originally in another format have been converted to the six-point format via proportional transformation.